Commercial Description:Our new spring seasonal beer, Karnival Kolsch is arriving just in time for our Fasching Karneval . We are very excited about the release of this beer. 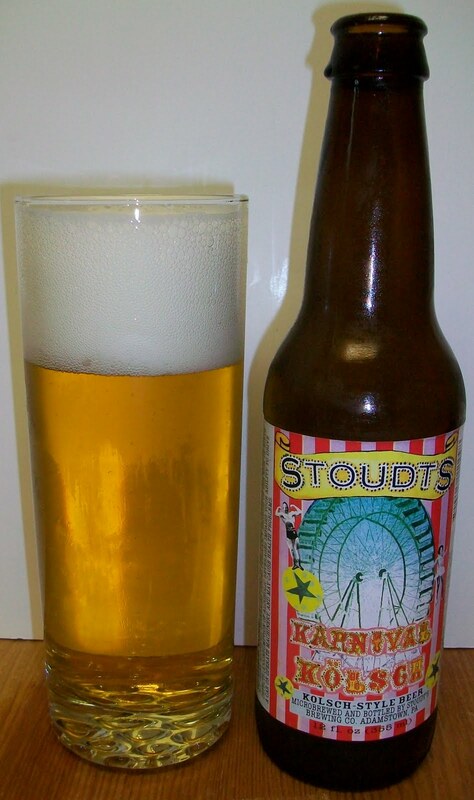 For the first time in Stoudt’s history, we are releasing a brand new beer that has already received a medal at the Great American Beer Festival. This refreshing German-style ale was brewed using 2-row malt, a small amount of red wheat malt, and all German hops for bittering and aroma. This straw colored ale is smooth like a lager due to the colder fermentation temperature and extended cellaring time. It is dry and crisp with a slight fruitiness which compliments the mild hop bitterness and aroma. This light ale is a fresh complement to most foods, but in particular fish, chicken, and salads. Karneval Kolsch will be available at your local distributor soon. Background:I have had this beer sitting in the fridge for several weeks. I’ve been waiting to get the proper glass to review it in. The German Stange (Kolsch) glass is the practically the only style of beer glass that I don’t have. So what’s in the picture above? I just found a new box of Libby glasses in basement and it had 6 rocks glasses and 6 of these glasses that are pretty darn close to a Stange. I’m sure someone in the household will discover this glass is missing; hopefully before they give it to someone as a wedding gift or something. Review:The beer pours a pale straw with golden hues and a bright white head. That’s a nice Kolsch. It starts out with a light malt sweetness up front then a very pleasant effervescence over the tongue in mid-sip. The back end starts to build a slight hoppy taste and it is very easy to swallow. The finish is dry and refreshing. There is just the right amount of hops to dry without bittering. The final aftertaste is mild with floral hops and light malts. This Kolsch is really good but it may be lacking some of that German earthiness. I’m not sure what that is but there is distinct earthy flavor to a German Kolsch. This is a great summertime beer; Clean, Crisp and Refreshing. It may be lacking slightly in the Kolsch flavor but all and all this is a good Kolsch. I am really enjoying this beer and at 4.8% you can have several and not worry about getting loaded. The head has diminished to a patchy island on top of the beer and a decent ring around the glass. The lacing is quite impressive. This beer is warming well but it is so refreshing you just can’t drink this too slowly. As soon as finish one sip you are called back for another and another. Soon the beer glass is empty and the review is over and you never got a chance for final thoughts. This is a solid B for a Kolsch. It may be the best American version of a German Kolsch that I have had. I highly recommend this beer to anyone that is looking for a nice refreshing summer beer. And I mean that in an old fashion way not this lemon zest American Summer beer thing that is going on. This is a good straight up classic beer tasting refreshing beer. The taste of a Kolsch is close to that of a pilsner with a little more earthy background to it. Clean Crisp and Refreshing.